In 1975 Pablo Cruise released its first A&M album simply entitled Pablo Cruise. The album cover was shot in the tropical gardens of San Francisco’s Golden Gate Park and it featured a huge gorilla standing front and center. The band, David Jenkins (guitars & vocals), Cory Lerios (keyboards & vocals), Steve Price (drums) & Bud Cockrell (bass & vocals) was nowhere in sight. At that point there was a bit of a mystique as to who Pablo Cruise really was. When asked, “who’s Pablo,” the band, which is a quartet, would answer, “he’s the guy in the middle.” When asked what Pablo Cruise meant, the well-rehearsed answer went something like this,”Pablo,represents an honest, real, down to earth individual; and Cruise, depicts his fun loving, easy going attitude towards life.” In essence that’s what Pablo Cruise’s music is all about. Honest, real, down to earth vocals, accompanied by fun yet elegant, infectious grooves. To hear Pablo Cruise on record is one thing, but to experience the band live is an exhilarating event. Throughout the late eighties, original vocalist David Jenkins continued touring and garnered acclaim in the country markets with the slightly ahead of their time country-rock band Southern Pacific. As they racked up hits like “Midnight Highway,” the chart topper “New Shade Of Blue” and “Honey I Dare You” (co-written by Jenkins) the band toured all over the U.S. In 1992 Dave connected with Hawaii’s native son, Kapono Beamer, and in ’95 the duo released the album “Cruisin’ On Hawaiian Time,” that became a critics’ favorite as well as being nominated for Hawaii’s prestigious Hoku Award for “Album Of The Year.” Since ’99 Jenkins has joined forces with the composite group, Rock & Pop Masters, that includes some of the great singers of the ’70′s and ’80′s. In May of 2011, Dave traveled to Iraq to perform for the troops with Bobby Kimball (toto), and Bill Champlin (Chicago)…..The troops really appreciated them being there in that hostile place to play for them. Pianist and Vocalist Cory Lerios decided to turn his writing and producing abilities to Film and Television. In 1986 Lerios landed his first network series, scoring ABC’s critically acclaimed “Max Headroom.” ABC’s “O’Hara” and “Police Story” immediately followed. Writing to “picture” became Cory’s newfound passion and in 1989, Cory and partner John D’Andrea landed the theme and underscore for NBC’s “Baywatch.” Scoring 11 seasons of “Baywatch,” garnering several Emmy Nominations, Cory won the coveted award in 1998 for his participation in the music direction of “Days Of Our Lives.” In the new millennium Cory has scored several animated shows including Disney’s “Kim Possible” and Universal’s “Land Before Time”. Cory has a very active catalogue and his music can be heard around the world every day! Aside from composing music for Film and TV out of his Westlake Village, CA studio, Cory will be the first to tell you that “there’s nothing like playing live”! During Pablo’s hiatus drummer Steve Price went on to become a leading figure in providing E-LEARNING for many companies around the United States as well as handling the lion’s share of E-LEARNING for the State of California under Arnold himself! Steve also has an aerial photography company that utilizes model helicopters that Steve builds himself….very impressive stuff!!! Pablo’s latest member Larry Antonino, bassist and vocalist extraordinaire, is a very busy musician and aside from playing with Pablo Cruise, Larry has kept is calendar full, playing with the likes of Air Supply, Barry Manilow, Ronnie Laws, Jeff Beck, and Al Jarreu to name a few! In the fall of 2011 Pablo Cruise will team up with Red Red Records (distributed by BDG a division of Sony Music Entertainment) to release their first ever live DVD/CD. As part of the package, they’re back in the studio with Grammy Award winning producer Val Garay (Val produced Pablo’s 2nd LP “Lifeline”) re-recording two of their greatest hits featuring two new up and coming singers. Their re-arrangement of “Place In The Sun” will be featuring the incredible vocals of RED RED RECORDS’ KATRINA, and their latest version of “LOVE WILL FIND A WAY” will feature the intense vocals of TY TAYLOR OF VINTAGE TROUBLE. 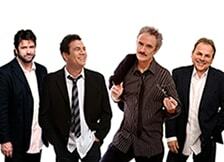 THERE’S NO QUESTION…..PABLO CRUISE IS BACK AND ALL THEY CAN SAY IS “IT’S GOOD TO BE LIVE”!